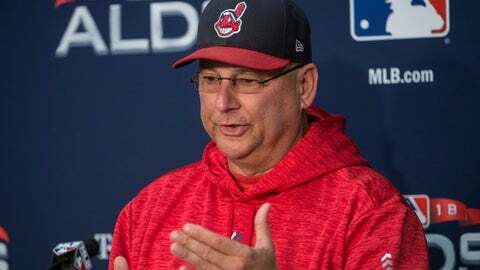 CLEVELAND (AP) — Indians manager Terry Francona found a simple way to sum up his team’s tenuous state this October. And he channeled Yogi Berra to do it. With his club down 2-0 and batting only .100 (6 for 60) so far in the series and facing left-hander Dallas Keuchel in Game 3, Francona juggled his lineup by starting right-handed hitters Yandy Diaz at designated hitter and Brandon Guyer in right field. Also, Edwin Encarnacion was switched from DH and play first base, replacing left-handed Yonder Alonso. The Indians were dominated in Games 1 and 2 by Astros fireballers Justin Verlander and Gerrit Cole. Cleveland has had some success against Keuchel, beating him on May 19 in Houston. The Indians scored three runs in the first inning and chased Keuchel after in five innings. In his second matchup against Cleveland on May 25, he allowed two runs and eight hits in six innings. Astros manager A.J. Hinch made two switches, starting Brian McCann behind the plate and using Tony Kemp as his DH instead of Tyler White, who served that role in the first two games. Francona knows all about overcoming daunting odds in October. In 2004, his Boston Red Sox rallied from a 3-0 deficit to beat the New York Yankees in the ALCS and eventually win their first World Series title since 1918. Last season, the Indians led the ALDS 2-0 before the Yankees stormed back to win the series. Francona said there’s no secret recipe to a comeback. “You can philosophize about it however you want,” he said. “There’s different ways of looking at it. We don’t want to go home yet, so in order for that to happen, we gotta win today. OK, that’s the best thing we can do is channel our energy into finding a way to win today.